Subacromial (shoulder) bursitis is a condition caused by inflammation of the bursa that separates the superior surface of the supraspinatus tendon (one of the four tendons of the rotator cuff) from the overlying coraco-acromial ligament, acromion, coracoid (the acromial arch) and from the deep surface of the deltoid muscle. The subacromial bursa helps the motion of the supraspinatus tendon of the rotator cuff in activities such as overhead work. Musculoskeletal complaints are one of the most common reasons for primary care office visits, and rotator cuff disorders are the most common source of shoulder pain. Primary inflammation of the subacromial bursa is relatively rare and may arise from autoimmune inflammatory conditions such as rheumatoid arthritis; crystal deposition disorders such as gout calcific loose bodies, and infection. How does bursitis affect you? Which motion is most limited and painful in cases of acute bursitis of the shoulder? Passive abduction. 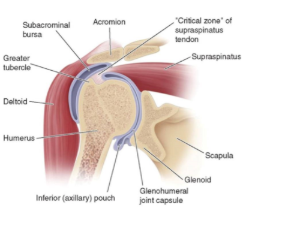 In cases of acute bursitis (swelling of the bursa), passively abducting the arm – performed by the therapist – is very painful because the head of the humerus is compressing a swollen bursa against the glenohumeral joint and the underside of the acromion. The bursa is generally the size of a small plum, but when inflamed it can be as big as an orange. When acute bursitis is present in the shoulder, it is impossible to lift the arm out to the side (abduction) without extreme pain. Is massage therapy a useful treatment in cases of bursitis of the shoulder? No. Inflammation of a bursa is not helped by direct massage. Directly massaging an inflamed bursa will cause more pain. Treatment will depend on the cause of the bursitis and aims to alleviate the symptoms as much as possible while the healing process takes place. Options may include pain-relieving medications, cold packs, gentle mobilising exercises and rest. Anti-inflammatory medications or injections of corticosteroids may be used in cases of severe pain. If infection is present, warmth, redness, pain and swelling will be experienced in the affected areas. Treatment with an appropriate antibiotic is necessary. If the bursitis was triggered by a particular form of overuse, it is important to avoid that activity. Such as a sport. Most of us look at a new year as an opportunity to ‘start fresh’ and ‘make changes’. 1st January rolls around and the motivation is high!! For some of us, 1st February see’s us right back to where we were the November before! Meh, there is always next year! So how do you keep the motivation and keep ticking things off your ‘Things I will do in the New Year’ list? We have put together a list of tips that we think should be able to help you. Be specific in what you want to reach or the goal you want to reach. If you would like to drop a few kilos, write down an achievable goal. Don’t make it unrealistic. It’s better to reach and celebrate small wins than it is to be disappointed when you didn’t reach your goal because there was no way you were going to drop 20 kilo’s in 2 months. Maybe you would like to catch up with friends more often. Decide how often and book the dates ahead of time. Let’s say you would like to catch up once every three months. Get it in the diary now. Send the message, make the call and pencil the time in. By being specific, you have something to action and it’s much easier to achieve. Reward yourself not only for the good times but also for the ‘Damn you gave it a good shot’ times. We are only human and try as we might, there are times when we will fail. You can look at it as a fail or you can look at it as a lesson learnt. Either way, you know you gave it a shot, you learnt from it and you will put it all into practise next time around. Reward yourself for that! Move a little. Move a lot. Move when and where you can. Try to incorporate a little exercise into your daily routine. Maybe park the car a little further away from the shops. Maybe walk to the end of the street and back again when you head out to check the letterbox. Maybe set a regular walking date with a friend that you know is busy but you would both love to catch up more often. Put on some music when you are doing the housework and get your boogie on!! Read more!! A little secret we want to share with you that has totally changed our lives….Audio Books!! Life is busy and often by the time we sit down at night we barely have the energy to keep our eyes open let alone hold a book. We listen to audio books in the car, while waiting to pick the kids up, while out on our walks. There is nothing better than to have a good story to take you away to a magical land if even for a short time each day!! Drink it cold, warm, with lemon, with cucumber. Drink it anyway you want but drink the damn water!! Water does amazing things to your body and will make you feel amazing and when you feel amazing you will feel motivated!! Declutter the clutter! This not only includes material things around the house but also your inbox. A cluttered inbox can be just as stressing as a cluttered pantry! Author Peter CornishPosted on January 3, 2019 January 3, 2019 Categories Blog, The benefits of massageLeave a comment on New Year… New You!! Author Peter CornishPosted on December 6, 2018 Categories The benefits of massageTags The benefits of massageLeave a comment on How can MASSAGE Help You Towards your Summer Body?